Fishing feeder Dave had more than a dozen slabs while Gary netted 10 and a 17lb carp for good measure. Others having fun there were Don Warner – a 13lb koi – while Ray Preedy was well-chuffed after spotting a big double and tempting it on freelined bread. 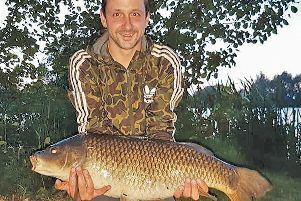 On one of Linford's syndicate lakes Bill Dean and Neil Cook shared 28 carp from 15 to 38-8 – plus eight tench and two inquisitive roach while Gary Maton had a 28-2 on the dayticket section. 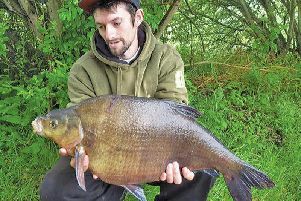 Bradwell's bream and tench run continues with Arthur Terrill, Nuala Gray and Tony Richards catching well while Owen Wye has been getting chunky carp at Wolverton Mill. At the other end of the scale Mark Fisher had a 50.9 gramme (1.792 ounce) Simpson canal ruffe...a mini-species biggie! LAKES Lane Lads and Canal All-sorts topped Sunday's MK canal league final round (Pattison Lane) but Browning Black took the overall honours! Top weight went too All-sorts' Ian Young with 8-7 of skimmers followed by Browning Red's Tom Webster and Paul Abbott, both 6-14, with Lads' Dave Tebbutt on 5-12. All-sorts collected 34 points on the day with the Lads on 31. Paul Abbott was series top individual. League: Browning Black 124 points; Lakes Lane 119, All-sorts 115, Browning Central 99, Maver MK 84, Browning Grey 78, Browning Red 73, Royal Oak 72, Tip-Top's Boys 63, Wootton 56. WILLARDS are running a weekly-draw (among those buying MKAA cards from the shop) with a tenner's worth of bait up for grabs! ALDERS: Charlie Lancaster 384lb, Nick Pringle 323lb, Sean Wain 230lb. TOVE Valley, Lakeside: Ed Blaine 81lb, Hayden Edwins 55-9, Rob Dzialak 54-11. TOWCESTER/Nene, Flecknoe: Brian Beard 63-12, Dave Gibbins 47-10, Mick Goodridge 43-8. CALVERT beat Brackley on Itter's Pit, with: Ben Holdaway 13-3, Barry Witteridge 8-2, Andy Franklin 8-1. TOWCESTER has joined the 21st Century, selling tickets on-line – www.t-daa.uk – and sold three already. FIXTURES: June 16, river season opens along with Lodge and Caldecotte South; also second MK individual league round, Bradwell Lake, 01234 713144; July 1, working party Kingfisher Pit clearing duckweed, all welcome.